Elana Herzog, "Untitled P141," 2016, paper pulp, textile, 30 x 22"
The works in “Compression” are palpably dense. 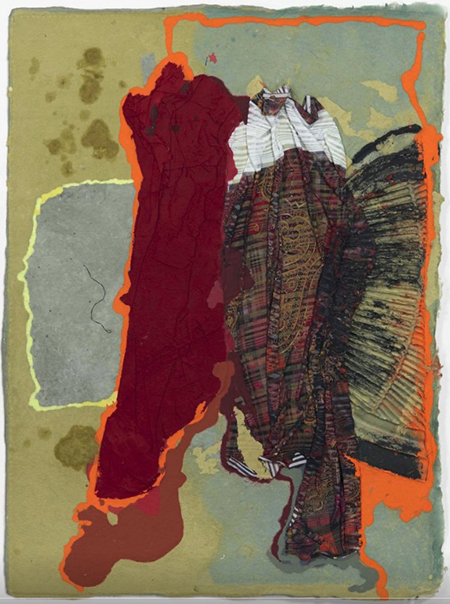 Artists Elana Herzog and Luanne Martineau share an affinity of “soft” material, of paper and textiles, heavily worked-over in material and process. The rectangular, abstracted works of Herzog bare some semblance to the thin, worn layers of Mark Bradford. Each of Herzog’s individual works contain unexpected details for the viewer to discover: a neon green splotch of paint among strips of faded pink textile, or the patterning of low-pile Persian rugs peeking through layers of grey, embossed paper pulp. The standout in this exhibition is Montreal-based Martineau’s “Knocking Hangers,” a enormous assemblage of textile, paper and objects of hand-needled felt. Hanging on a black, fabric rectangle and mounted on the wall, like so many trinkets spread out on a blanket at a yard sale, are felted approximations of all kinds of stuff: ashtrays with butts, filleted fish carcasses, dead roaches with their legs in the air, beer mugs and clothes hangers. Some of these things, like the felted pile of sandwich fixings, might feel like novelties if displayed on their own. Gathered in this way, they’re more powerful, transformed into a lexicon of humble symbols. Together, both Herzog and Martineau succeed in drawing us into their masterfully constructed messes, and rewarding us when we do.